iPayRoadTax.com reader Leon Rushworth scored a coup of behalf of cyclists when he refused to take ‘no’ for an answer following a complaint to car company Peugeot, which had been using the words ‘road tax’ in a promotional campaign. Peugeot has now expunged reference to the tax abolished in 1937 thanks to Rushworth explaining that some motorists use ‘you don’t pay road tax’ to infer that cyclists have lesser rights to use roads. 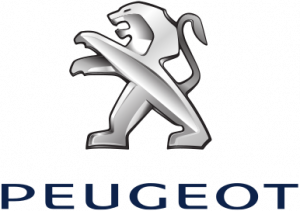 Peugeot had been using the antique phrase on its ‘Just Add Fuel’ campaign. No such luck at Fiat. Despite running an advertising campaign featuring professional road cyclists – a campaign that was originally going to drop reference to ‘road tax’ – Fiat is adamant that nobody complains about its use of a term used to hate on cyclists (despite the complaints from iPayRoadTax and many readers). 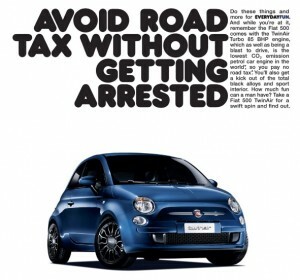 Fiat’s advertising campaigns don’t put ‘road tax’ in just the small-print: many of the posters, newspaper ads and online ads use the long-dead term in headlines. Does the fact some motorists don’t know what pays for roads bother you? Wear the iPayRoadTax jersey and tell the world! Foska.com currently has a promotion on the jerseys (£29.95 instead of £48.95) and toastie winter jackets (£49.94 instead of £99.99). The new, yellow iPayRoadTax jerseys are due in by the end of June. This entry was posted on Thursday, June 14th, 2012 at 1:11 pm	and is filed under No such thing as road tax!. You can follow any responses to this entry through the RSS 2.0 feed.